The Dell PowerEdge R930 Rack Server is the industry leader for high performance computing and storage with scalability to support the computing power needed for even the most data intensive or heavily virtualized environments! Out of the Dell 4U server family the PowerEdge R930 is made to have the most of everything from processing power to memory to storage, making it a great fit for either on-premise or datacenter server solutions. Featuring the Intel Xeon E7-4800 v4 and E7-8800 v4 families of processors, the Dell R830 has processing speeds of up to 3.2Ghz, memory cache of up to 60MB, and core counts as high as 22 cores. Storage and memory are also very scalable in the R930 PowerEdge Server with RAM scaling up to 6TB maximum, and storage up to 48TB for either SATA, SAS, or Solid State Drives. 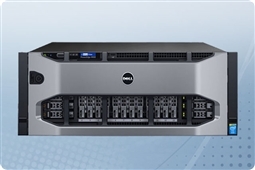 This and more makes the Dell PowerEdge R930 the ideal new Dell server for large databases and ultra dense virtualization, assisting SMBs and IT Professionals in Getting IT Done! Aventis Systems is proud to offer the Dell PowerEdge R930 4U Rackmount Server in New condition. All Aventis Systems servers come with a 3 year Comprehensive Warranty, with eligibility for optional Express, Extended, and Secure Drive Warranty Upgrades as well as Onsite Services. So shop below for the perfect scalable solution for even the most virtualization dense and intensive enterprise or SMB application requirements with the Dell PowerEdge R930 24 Bay Server! 3TB (12 x 256GB) SATA III 6Gb/s SSD 2.5"